I took a 4 day canoe trip from Long Lake down the Racquette River over the 1 mile carry to the Crusher (Racquette River and Route 3). 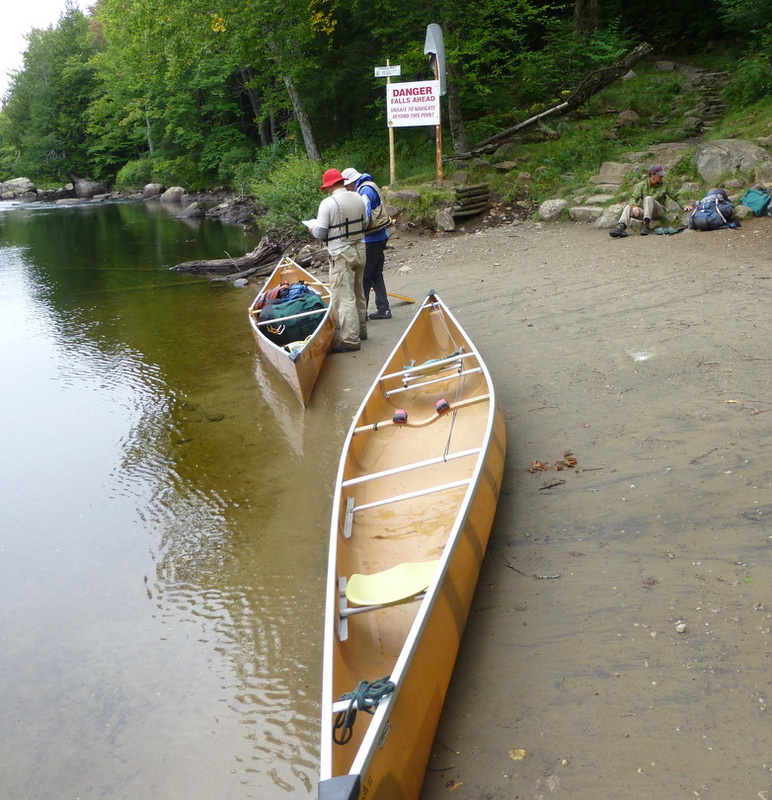 This route is part of the Northern Forest Canoe Trail and most of the route of the 2nd day of the 90 Mile Adirondack Canoe Classic. 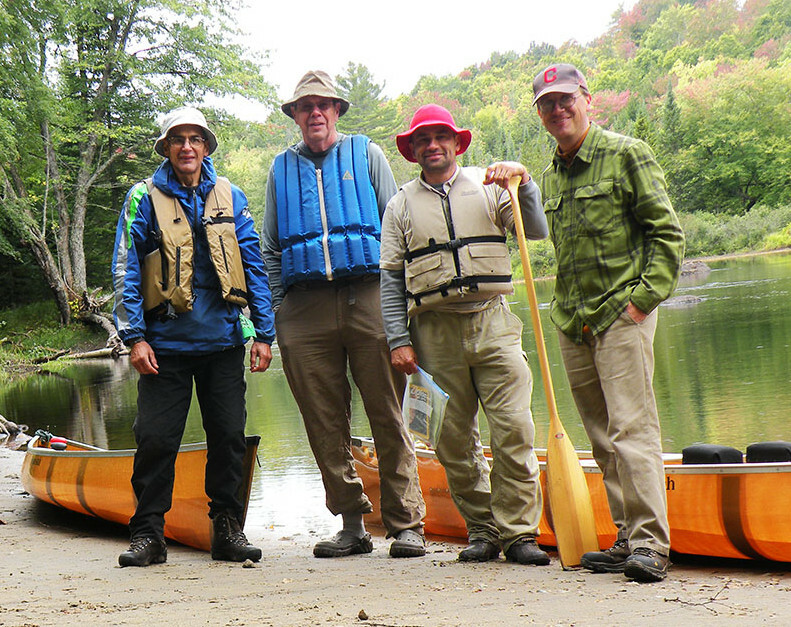 I went with the two Paul’s from the local ADK chapter and Bill Ingersoll, author of the Discover the ADKs series. Wednesday was beautiful, sunny and no wind as we crossed Long Lake. As we paddled north on Long Lake we passed several lean-tos. 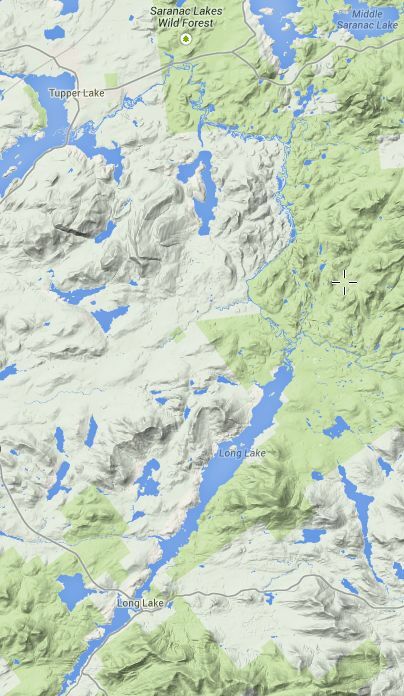 There are other campsites up both sides of Long Lake without lean-to’s and are shown on the canoe route map. Between the end of Long Lake and Raquette Falls there are few sites once you pass the Cold River confluence. The tent sites get much less traffic and most have an outhouse somewhere back from the site. All the lean-to sites do also, but due to the increased number of visitors and the general inexperience of the campers, some lean-to sites can be messy. Bill, his dog Lexi and I paddled down the Raquette River and proceeded up the Cold River. The Cold River is navigable for a little ways upstream from it’s confluence with the Raquette River. There’s a trail/herd path to Shattuck Clearing from where you can’t paddle any further upstream. The trail along the Coldriver is called the Pine Point trail. Paul and Paul missed the confluence with the Cold River and proceeded down stream on the Raquette River all the way to the Raquette Falls Carry, approximately 1 hour and 15 minutes further. Realizing their error they paddled back upstream and re-joined us at the Calkins Brook Lean-to on the Cold River. We cooked dinner and played a little three handed pitch before turning in for the night. 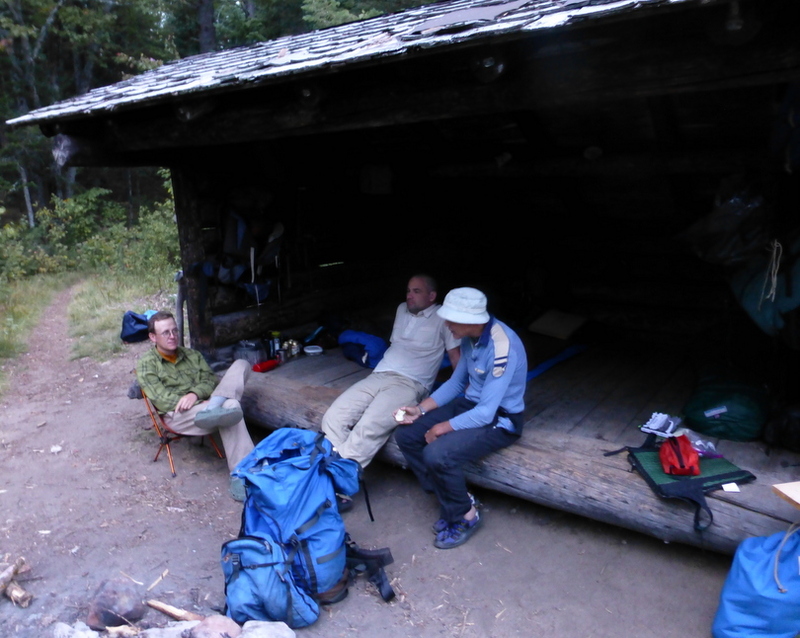 Paul stayed in his tent while Bill, Lexi, Paul and I slept in the lean-to. We heard owls during the night. It was windy and it rained overnight; continuing an on-again, off-again rain and wind until mid-afternoon when it broke long enough for Bill and his buddies to go searching for a trail head on the Cold River. Friday we paddled down the Raquette River and did the carry which skirts waterfalls with some class 2-3 rapids with “must moves” above the falls. We leap-frogged the carry splitting duties carrying packs and canoes. At the bottom of the carry we paused for a snack and to re-group prior to hiking to see the lower falls of Raquette River. Below Paul checks out the two plank Lazy-boy chair. The Lower Falls displays a significant amount of elevation drop. We camped at a lean-to slightly below the falls. Our lean-to was crashed by a couple of other paddlers who claimed they couldn’t find the lean-tos on either side of ours. They just pulled in and started unloading their gear without seeking consent. There were two lean-tos within walking distance on either side of us. They ended up tenting on the site, but they wanted to hang their food bag in the lean-to! Without asking! I wasn’t happy about it – I mean there is only 6.1 million acres for them to camp in. Fortunately they stayed to themselves and turned in early. We cooked dinner and played 4 person cut throat pitch until 9pm and turned in. We heard coyotes and owls during the night. Saturday morning it was 35 degrees when we got up. Our tenting partners woke up cold, packed quickly and headed out downstream. We ate breakfast, pack up and were paddling downstream by shortly after 9am. After paddling for 30 minutes we warmed up. I shed a layer and exchanged my fleece jacket for access to my rain coat as dark clouds were threatening. As we paddled downstream we were passed by DEC Ranger Gary Valentine who warned us of a thunderstorm coming in around noon, but stated “the way you are paddling you should be pulled out at the Crusher by then”. Ten minutes later it started raining; a cold, wind driven rain. 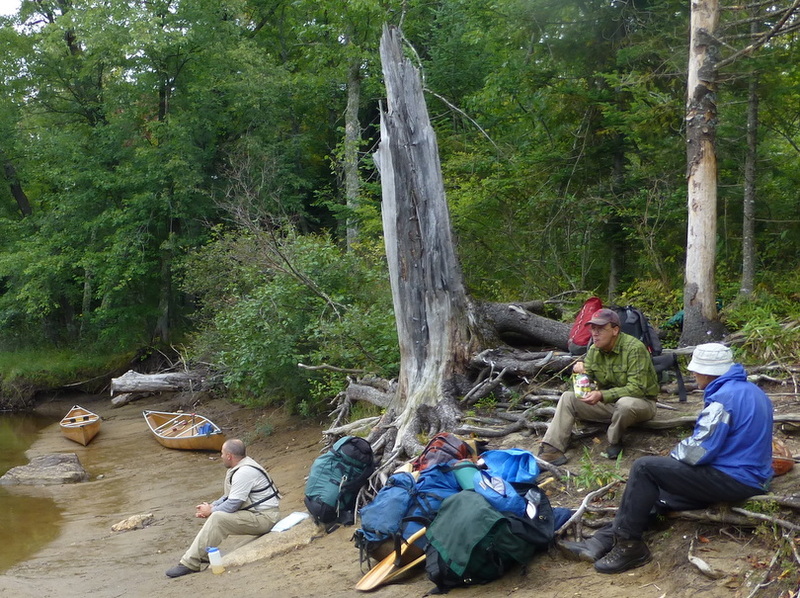 We caught up and the canoe bearing the two men who tented on our lean-to site and passed one hunting tent with a man sitting dry under his canvas tarp while the rain soaked canoeists paddled by. 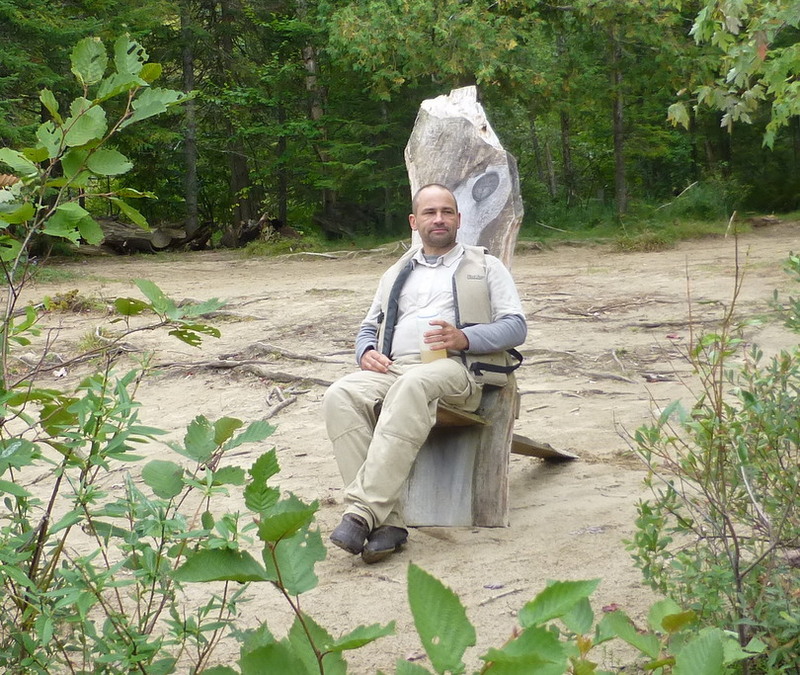 We passed the outlet to Stony Creek Ponds and made it to the Crusher slightly before noon. The Crusher launch site is just northwest of Trombley Landing, near the intersection of NYS Route 3 and 30. The Crusher is the common end point for Day 2 of the 90 Miler Canoe Classic. There’s a large paved parking lot and a wide ramp for launching boats and an outhouse. We were very glad to reach the cars, load up the canoes and change into dry clothes.